Cloudy with occasional rain showers. Thunder possible. High 48F. Winds NNW at 10 to 20 mph. Chance of rain 50%.. Considerable cloudiness with occasional rain showers. Thunder possible. Low 39F. Winds NNW at 10 to 15 mph. Chance of rain 50%. 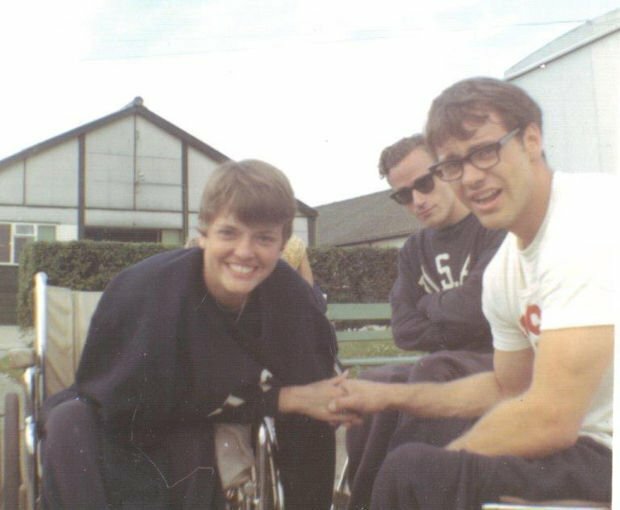 Judy Webb (Harris) and Tim Harris, far right, are pictured near the track between competitions at the 1967 Pan Am Wheelchair Games in Winnipeg, Manitoba. 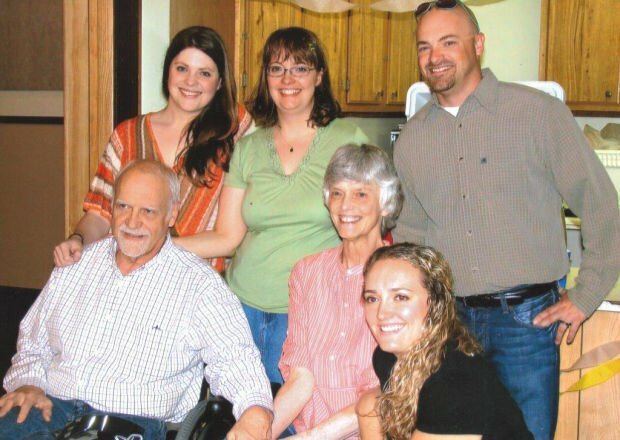 Paralympic pioneers Tim and Judy Harris pose for a family photo with their four children. Back row, from left, Annie, Molly and John. Front row, Tim, Judy and Kate. When it comes to international athletics, Tim and Judy Harris might be Helena’s best-kept secret. Fifty years ago, Tim Harris garnered a total of 11 medals at the 1964 Summer Paralympics in Tokyo. Four years later, his future wife Judy Webb captured Silver and Bronze at the 1968 Israel Paralympics. So where does the Harris couple display those 13 Paralympics medals, which are the equivalent of the Olympics for people with disabilities? Tim and Judy’s medals are stored in a shoe box. And their dozens of press clippings, yellowing and folded, are randomly and loosely stored, between the covers of a scrapbook. It’s not that Tim and Judy Harris, who have both been wheelchair users most of their lives, are not proud of their athletic achievements. It’s just that the couple’s priorities dictate a belief that what they accomplished was nothing to be boastful about. Tim and Judy retired from competition after getting married in 1970. They went on to have successful professional careers, can do just about everything everyone else can do and have been lifelong advocates for people with disabilities. And according to one of their daughters, the Harris children were brought up just like everyone else. “When I was small, I never thought about how my parents were different,” Molly Harris related. “I worried about the neighbor boy’s parents, who clearly did not know how to use a wheelchair. Tim Harris attended high school in Rockford, Ill., before entering the University of Illinois in the fall of 1961. He had contracted polio at just 18 months old, and by the time he reached college he was competing in athletics in a wheelchair, although he was still about to able to move around on crutches. Tim was a versatile all-around wheelchair athlete, competing in football, basketball, track and field, track slalom, swimming, ping pong and archery. As a freshman at Illinois, he played 6-man wheelchair football. “We played indoors, and it was brutal,” recalled Tim. “It was two-hand touch above the knees, and there was a lot of pushing and shoving going — you blocked with the big wheel, bodies and chairs were flying around all over the place. The inaugural Paralympics took place in 1960 and ran in conjunction with the Rome Olympics. From 1960-72, only wheelchair athletes were allowed to compete, but beginning in 1976 athletes with other disabilities were included in the games. At the 1964 Paralympics in Tokyo, which took place in the same venue as the Olympics, Tim was part of a U.S. team that led all countries with 123 total medals. Harris garnered three gold medals, in the track 180 meter wheelchair relay, the swimming medley relay and as a member of the basketball team. His Paralympics silver medals included the 60 dash, discus, pentathlon and 50 freestyle. Tim’s 1964 bronzes included the club throw, javelin, shot put and 50 breaststroke. Tim’s career spanned eight seasons, from 1963-70, while Judy competed from 1967-69. They participated around the world, between them traveling to England, Spain, France, Jamaica, Scotland, Ireland, Argentina, Italy, Greece, Hawaii and Manitoba. His best throw in the discus was 130 feet in exhibition, and 112 feet in competition. He said they would usually have one or two guys sitting on the ground holding the chair down so it wouldn’t flip over during throws. In all, Tim guesses that he collected over 30 gold medals and numerous championship trophies, while setting no less than seven world records. The actual numbers may be higher, however, considering his modesty. One of his best years was 1965, when Harris — who possessed a powerfully muscled upper body — captured six national championships for Illini’s “Gizz Kids” and seven golds at the international (world) games. At 15 years of age, Judy contracted a neurological disorder that left her a paraplegic. After graduating from Billings Central in 1966, she attended the University of Illinois because it offered the opportunity for people with disabilities to compete in sports. Her forte was archery, although back then everyone was asked to compete in other events. The annual national tournament took place at the New York Wheelchair Games, and from there the international team was chosen. Judy captured three successive national championships, from 1967-69, which qualified her for the International Stoke Mandeville Games, in England. In 1968, she competed in the third Paralympics, which was relocated from Mexico City to Israel. “The competition was really stiff, and I placed second and third,” Judy related. “The second was to a world class archer from South Africa (Margaret Harriman). She beat all the men, and even won competitions against non-disabled archers. Judy was also placed on the women’s basketball team, where she was not alone in competing in a sport out of her element. “We practiced at night, and we were the evening’s entertainment for those in the stands because we were so bad,” she laughed. But the United States must have made a few baskets, bringing home the bronze medal. It was a different world for people in wheelchairs 50 years ago, before locales became more accessible. The Harris couple related that transporting “30 people in wheelchairs on a bus was a huge deal,” describing how the chairs would be stacked in the middle aisle. They also mentioned inaccessible bathrooms and being pulled up staircases backwards. One unforgettable occasion took place in Ireland, when they visited the Blarney Stone. Tim was able to make it to the top and back of the 90-foot climb using his crutches, while Judy made the journey riding piggy-back on her coach’s back. Just as compelling as the Harris’s athletic achievements is their relationship. “When I first got to Illinois, my coach was a friend of Tim’s, and it wasn’t long before my roommate and I got sick of hearing all his stories about the great Tim Harris,” Judy recalled with a smile. Tim noted that their first meeting was quite a “flop.” Literally. “I was driving a salmon-colored Pontiac Continental, and I pulled up to the practice filed where Judy was,” he recounted. “There was a hedge around the range, and when I put one crutch on the other side and tried to vault over it, I fell flat on my face. “I thought he had a huge ego and was very pompous,” Judy said. “But when we went to the ’67 nationals in New York, Tim was in almost every event and was running around helter-skelter to compete. The couple were married in a wheelchair ceremony in Billings in 1970. After returning from Illinois to Billings in 1972, the following year they relocated to Helena, where they have resided for the past 41 years. Tim and Judy brought up four offspring in the Capital City, including Annie, Molly, John and Kate. Tim and Judy recently watched the Opening Ceremonies of the 2014 Winter Paralympics in Sochi on TV with a somewhat nostalgic mindset. Judy said they look back on their days of competition with fond memories of being pioneers in wheelchair sports. Molly also watched the Opening Ceremonies in Sochi. “It fills me with indescribable pride to know that my parents were world-class athletes, and that people all over the world have seen them,” she wrote.